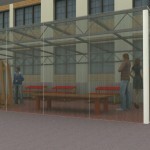 Apex Shelter Systems have just launched a new range of outdoor classrooms. The classrooms are custom made to suit any size or application. A free of charge UK site visit is available. An outdoor classroom is ideal for an evolving curriculum, providing sensory experiences leading to greater levels of creativity and understanding. The playground is full of exciting things for the children to experiment, discover and explore with. All our outdoor teaching facilities are built to combine practicality with simple design. We offer a wide range of outdoor classrooms that are available with optional seating and Lighting. It is important to us that everybody using the classroom has shelter from all weather conditions through the provision of shade and shelter. There are a wide range of options for the material used for the manufacture of the classrooms.